Almost everyone who first comes into my gym has shoulder issues. It may be from poor posture, injury, working on a computer all day, or poor exercise program design. Whatever the reason for jacked-up shoulders, there’s only one thing to do… Fix them! Notice anything interesting? All of the rotator cuff muscles attach to the shoulder blade! It doesn’t matter how strong your rotator cuff is if the muscles anchoring the shoulder blade are weak. I like to use the anology of trying to throw a big rock while you’re standing on an icy parking lot: The stronger you can throw, the more likely you are to knock yourself down. 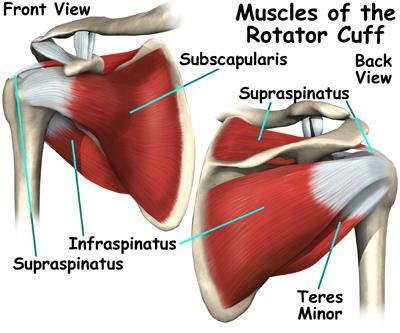 The same thing happens in the shoulder: Super strong rotator cuff muscles won’t prevent injury if they’re on an unstable surface. Shoulder pain happens when these muscles are stiff and weak; the shoulder blade dances around and causes all sorts of problems. I’m going to break down each move for you, then give you a program you can follow at home to help get rid of shoulder pain by fixing the CAUSE of imbalances. Your arms shoulder be just above 90 degrees from your torso, with your thumbs pointing to the ceiling. 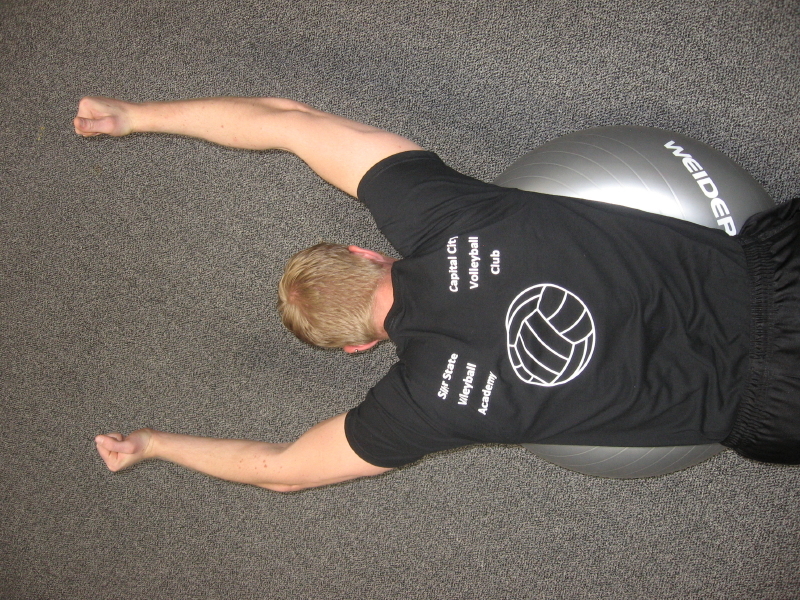 The BIG KEY here is to squeeze your shoulder blades together – to “pinch a pencil” with your scapula. 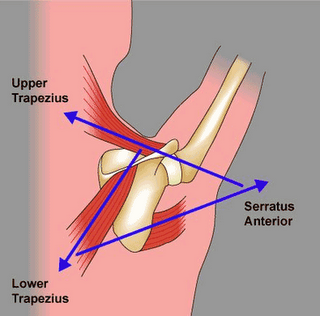 If you have weak shoulder blade retractors, you’ll unconsciously pull your arms down toward your hips to substitute the big muscles of the lats for your weak retractors. The angle should NEVER be less than 90 degrees from your torso. 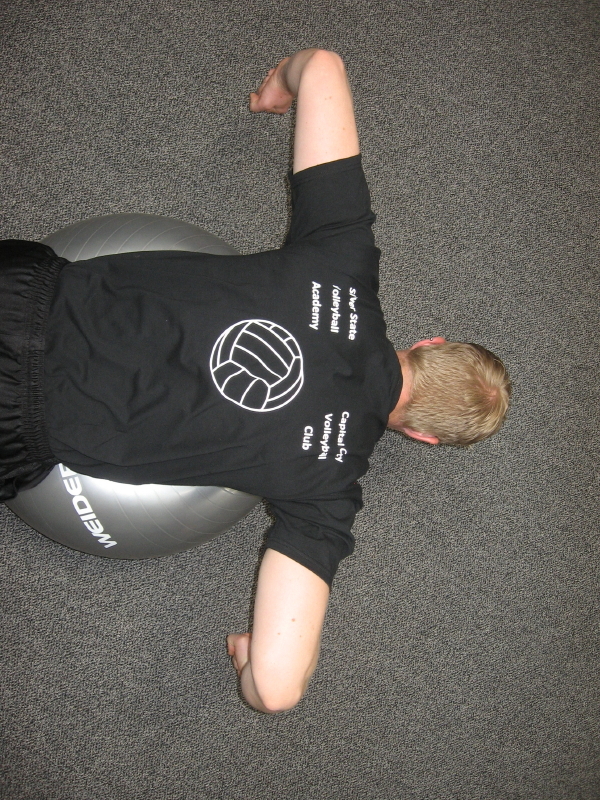 Your upper arm should be at a 45 degree angle from your torso, with your elbows locked at 90 degrees. Touch your elbows together in front of your chest, then pull your shoulder blades together to flare your arms. This is a big time external rotation exercise. 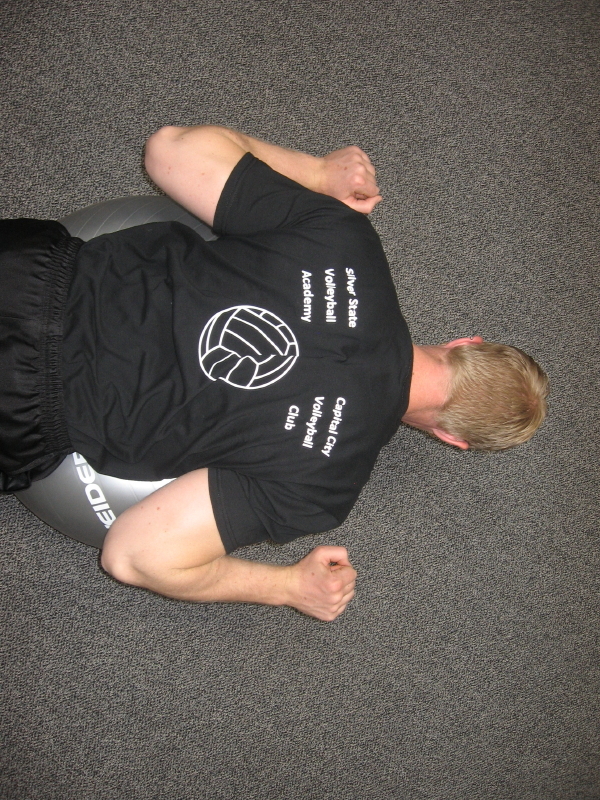 When you sit or slouch, your shoulders pull inward. With this exercise you reverse that movement. Your upper arms should be straight out from your shoulders (90 degrees from torso) and you want to lock your elbows and rotate your arms until your wrists are by your ears. A common mistake with this movement is to curl your hands in toward your body instead of keeping the elbows locked and rotating your upper arm. Very simple: just push your hands out and up and pull your shoulder blades down towards your hips. Bring your elbows all the way to your ribs and then press again. I first learned this circuit while I was interning at a Physical Therapist’s office. It’s very simple, and here’s the key to making it work: Focus on moving your shoulderblades in order to move your arms, not using your arms to move your shoulderblades. 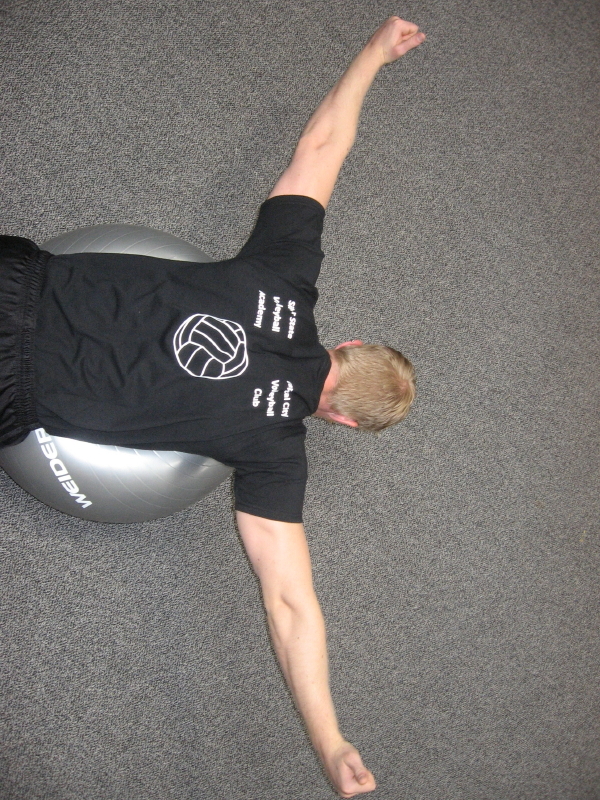 The emphasis should be on scapulothoracic (shoulderblade) movement, not on glenohumeral (shoulder) movement. 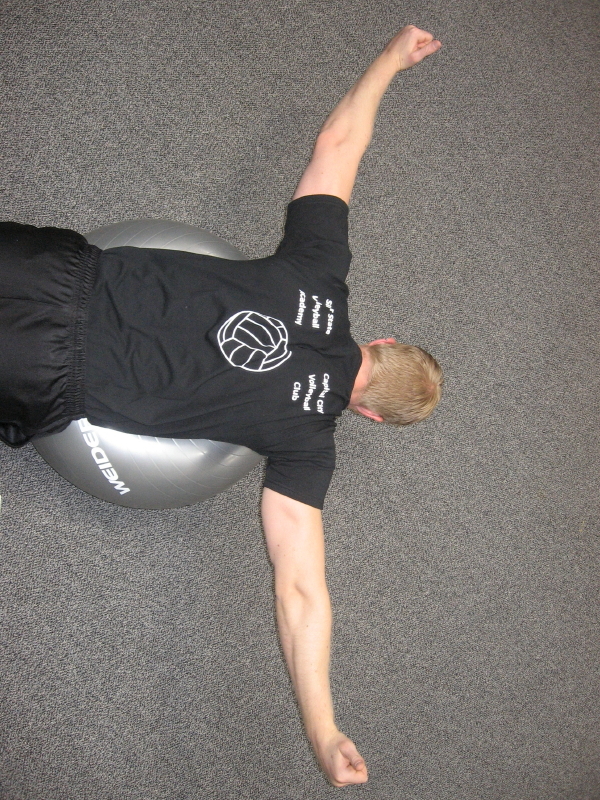 This changes it from an ok shoulder exercise into a great shoulderblade stabilizing exercise. 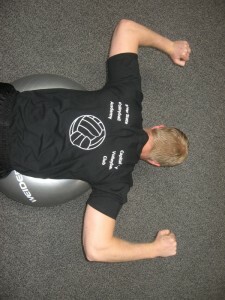 I like to use a Swiss Ball as my chest support, but a bench, incline bench, or any other support works as well. If you’re SERIOUS about fixing your shoulders, you can do this every day. If you’re just preventing shoulder issues, 3 times a week is enough. 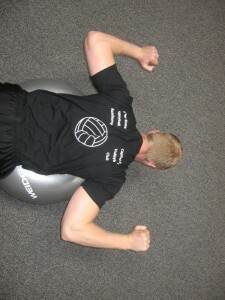 What you’re going to do is 8 reps of each position with no weight and no rest in between movements. This is a total of 40 reps per set. Add two reps each week until you reach sets of 20 reps each (100 rep set). When all 100 reps can be done perfectly for 2 sets, go back to sets of 8 with very light (one or two pound) dumbbells. That’s it! It takes 2 minutes a day. Lots of my personal training clients have found the shoulder pain they’ve lived with for years completely disappear in less than a month! 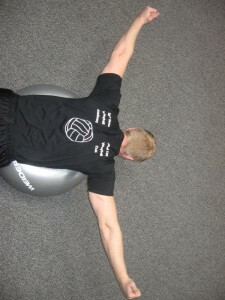 If you have shoulder pain, get on the YTWLI circuit! You, my friend, ROCK! I found just the info I already searched all over the place and just could not find it. What a great website. I’ve bookmarked your page and will check back often. Thanks for the great information!